The Steel Valley Yarn Crawl was an absolute blast, especially getting to do it with my mom. I haven’t even told you about the raffles – oh, the raffles! – mostly because we didn’t win anything. Every single store had three massive prize baskets, and the more you bought there, the more tickets you got to enter for whichever baskets you liked. Then, if you filled up your passport, you were entered for the grand prize of gift certificates to each store. As I said, we didn’t win anything, but I was very proud to fill my passport with colorful stamps! I’m only sad I had to turn it in for the grand prize raffle. The idea of having each store contribute a section of pattern for a single project was extremely clever, especially since they designed it in such a way that you could use as many or few of the patterns as you wanted. My cowl has become an extremely tangible souvenir of the whole experience, melding my creativity with so many other artists’ in my valley. 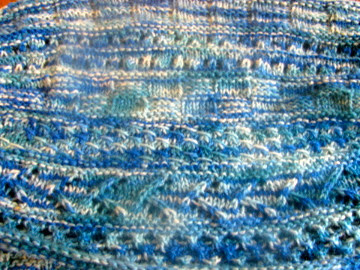 About my yarn problem – I ran out of green on my last row. that meant I had no hope whatsoever of having enough to cast off, while preserving any semblence of the last stitch pattern. So I did something rather drastic (and tedious): I picked out my cast on. (Ugh. Such a pain.) That left me with plenty of yarn to finish my final row, and I bound off at both ends with the leftover burgundy. I love how the bind offs tie the piece together. I think it will look very fetching with my collection of very neutral fall and winter coats. The burgundy grounds me in the present (and just a little bit to my beloved Redskins). That spring green is the exact color the wooded landscape turns when all the trees start to bud, so I will also carry with me the promise of warmer weather. I am in love with the silk tweediness of Fiber Company’s Acadia yarn. Mom made her cowl out of some pretty stash yarn she had. She did it mostly in the same order I did, but let her stripes go a bit wider since she had more yarn. Isn’t it pretty? “I decided to use this Perendale-Mohair sock yarn because it was a thick sock yarn, more like a DK, and the colors were very cheerful. 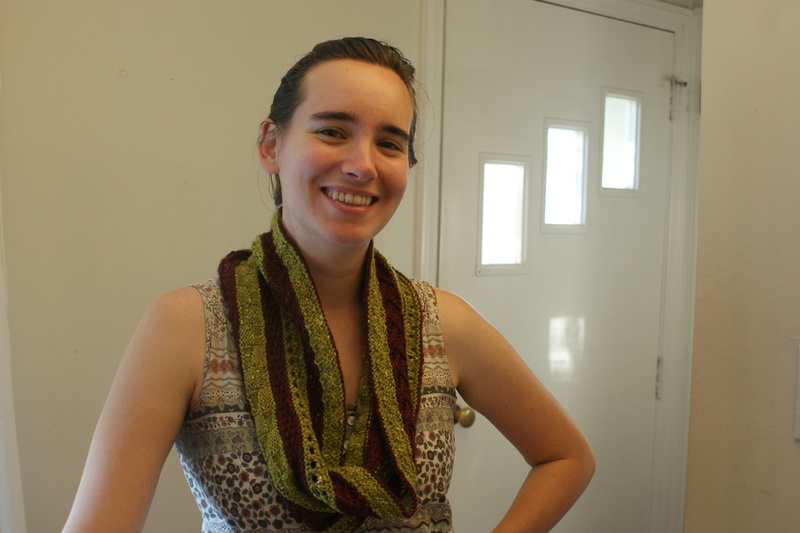 Because it was mohair and not very soft, I wanted to make a shawlette instead of a cowl, to wear around my shoulders rather than my neck. “Now I cast on this project while at my mother’s house and we were both watching golf and chatting. Consequently, despite my best efforts, I did end up with a twist in my circle of 225 stitiches. I didn’t find this out until row 6 (OK, I’m slow), so the decision was, do I leave it in or rip it out and start over? I decided that I’d be adventurous and see what would turn out if I left in the twist. Turns out it’s not like a mobius which is a half twist, making one continuous edge. Instead it’s a full twist. 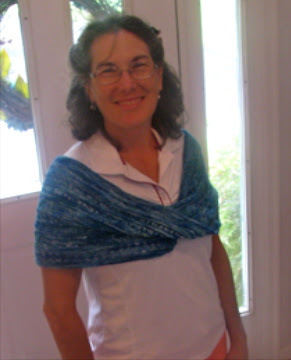 When I wear this shawlette, the front shows up on both shoulders…..that’s kinda nice! I like it! Sometimes a mistake ends up OK. Thanks for hanging in there through this week’s posts, coming along with us on this little crawl through some of Pittsburgh’s yarn shops! What do you think? If you are from around here, what is your home shop? What shops were not on the crawl that I should visit sometime? If you are not from here, what shops appealed to you most to visit, should you ever be in the area? 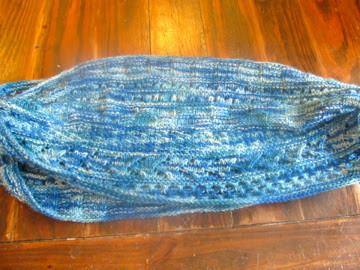 Do you have awesome yarn crawls in your region? Thanks for taking me along on your yarny adventure. I loved looking inside all the stores, especially Yarns Unlimited. I would love to visit that area some day! There is a Colorado yarn crawl later this month. It extends from north of Denver up into the mountains and then down to Colorado Springs. I think it lasts about 9 days. But it covers a huge area, and if I could get Chris to do it with me, we could only visit the ones close by on a couple of Saturdays. Well see. You and your mom made it look like so much fun. I would really like to try it. And having a toddler that enjoys fiber is an extra-special blessing!